There are so many improvements occurring on the John Adams Middle School campus it is challenging to pick a favorite. Perhaps the most exciting is the looming replacement of the auditorium with a state-of-the-art performing arts center seen in the rendering above. Though students and staff might be most excited about the addition of air conditioning to the campus. After numerous stakeholder and community meetings, construction will begin this spring on a modern performance space with seating for 750 and a larger stage, big enough to hold the orchestra or band. The theater will include a new choir room and backstage support facilities. The music building will be reconstructed and modernized to support the orchestra and band classes. The center will include a multi-purpose rehearsal room, that will be used for dance, community meetings and theater rehearsals, and an expansive courtyard. The current plan calls for demolition of the current auditorium to begin in May. The original auditorium was closed when seismic issues were discovered in late 2014. Construction will be in full swing when students return in August, with the new spaces projected to be ready for use by the start of school in 2021. The music building will be completed for school to start in fall 2021. The Heating, Ventilation and Air Conditioning (HVAC) and Fire Alarm project is in full swing. This phase of construction is upgrading and adding HVAC to 40% of the buildings. This work is to be completed this summer. The second phase that will improve the other buildings will commence this summer. In the new restrooms, 10 low-flush toilets were installed, each saving 31 percent per flush. In the boy’s restroom, five high-efficiency urinals are saving 87 percent of water per use. Future sustainability plans include replacing 43 more toilets with low-flush units. Two new bottle-filling stations were added by the track and field giving students access to fresh water to refill their reusable sports bottles. Removed and replaced the entire field and striping. 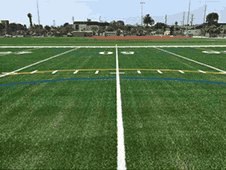 New environmentally-friendly cork infill material was used that can reduce field temperature by 20 degrees versus standard crumb-rubber-filled turf. • Removed existing dirt softball field and replaced with artificial surface. • Paved the area along the property line fence. The district acquired the former Sunset Park Christian Church on the corner of 16th and Maple Streets. The building has been demolished and the site improved temporarily to support swing space parking for the JAMS faculty during the construction of the performing arts center. The long-term use of the property is being planned. Funding for most of these projects is from bond measures previously approved by voters. Number of students enrolled in the sixth through the eighth grades for the 2018-2019 school year. Number of couunselors -- one for each grade -- whose mission is to help students better understand themselves and their world. As of Nov. 26, Adams had generated 87.8 kilowatt hours of electricity for firscal year 2018-2019 via solar panels, the second-most of any school in the district. We appreciate the patience, cooperation and support of parents, students and staff as we make important improvements that are paid for with funds from bond measures BB and ES - approved by voters previously - & measure SMS, approved in November. In fall 2010, outdoor improvements were upgraded near the athletic field. Tree planters and built-in bench seating was installed for students to enjoy during recess hours. A teaching garden was installed for educational purposes. Modernization and new construction included a new attendance office at the entrance providing improved supervision, safety, and security. The old attendance office was newly remodeled to accommodate the art classroom. The 80's east wing was replaced with new classrooms, a parking lot, and a lunch shelter. New bleachers and a stage area were constructed at the Commons Space. 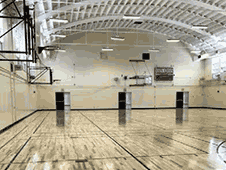 A new fire system was installed and two tennis courts were constructed to replace those that were previously removed. The John Adams Middle School project reflects Collaborative for High Performance Schools (CHPS) criteria by improved day lighting, improved air quality and natural ventilation, maximized energy efficiency, reduced water use, and storm water treatment. Construction began in August 2011. The front entry, attendance office, art classroom and courtyard, and main offices were complete in April 2013. The 80's east wing classroom buildings were completed in May 2013. Twenty-one existing classrooms were upgraded to the district's new technology standards. The standard includes a projector and screen, document camera, DVD player, and a sound system with a wireless microphone. The school has been upgraded to 1Gpbs networking and campus-wide Wifi. The telephone systems were replaced with a district-wide IP telephone system (VOIP). One teacher and eight student laptops were provided for 16 science classrooms.